With the premiere of Star Wars: The Force Awakens approaching quickly, I got an idea to experience the original trilogy like I never have before...through the visuals of Star Wars inspired album art. One of things that first drew me to the franchise was not the films themselves, but the music. I was born in 1976 and I did not see any of the films in theaters during their original release. It wasn't until about 1984 that I actually watched the original Episode IV film when my parents rented a VHS player at a local store along with a Star Wars videocassette. It's hard to pinpoint exactly when I became interested but if I had to guess, it was probably thanks to the Ford Motor Company. That same year, my mother bought a new car that came with a factory demo cassette that featured the main theme from Return of the Jedi and popular Top 40 songs. I believe it was John Williams' familiar score that brought me into the world of Luke Skywalker and Darth Vader. 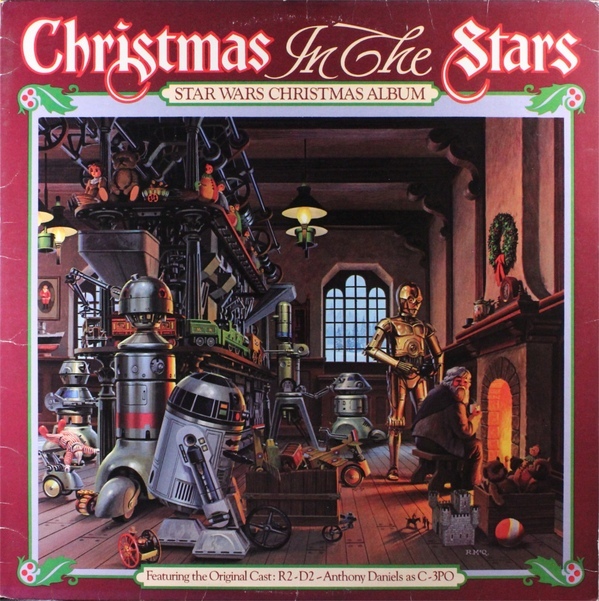 His intergalactic theme also inspired several recording artists and orchestras to release Star Wars inspired albums in the late '70s and early '80s. Whether they were motivated to produce the soundtrack in a new genre or just take advantage of the films' popularity, these albums featured some great (and not so great) album cover artwork. This 1980 album is definitely not the best Star Wars album by Meco. In fact, I've expressed before that it contains one of the worst Christmas songs ever. However, I LOVE the cover artwork which was done by Star Wars production artist Ralph McQuarrie. Santa looks at peace just sitting by the fireplace while R2-D2, C3PO, and other droids are presumably working hard in the toy factory. I bet Santa and the elves welcomed the automation on the assembly lines! Wow. I'm not an expert on Star Wars art, but I would've imagine this image was borrowed from something official (especially with the trademarked logo in the top left corner.) 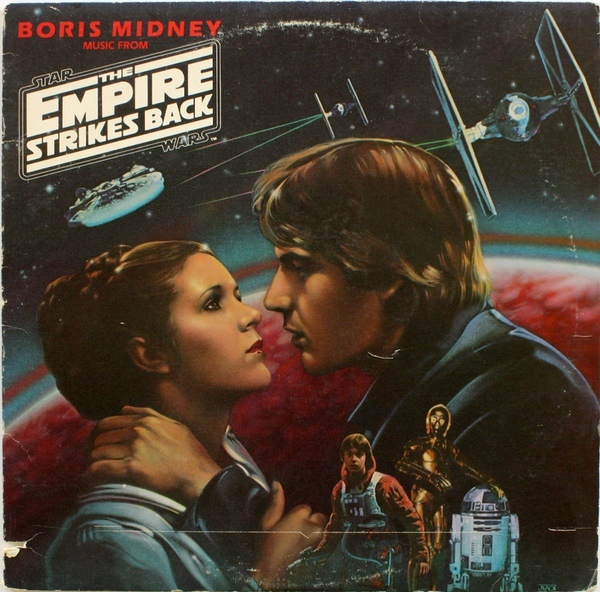 Artist Jeff Wack designed this cover just for Boris Midney's 1980 disco remix album who apparently had some deep pockets. 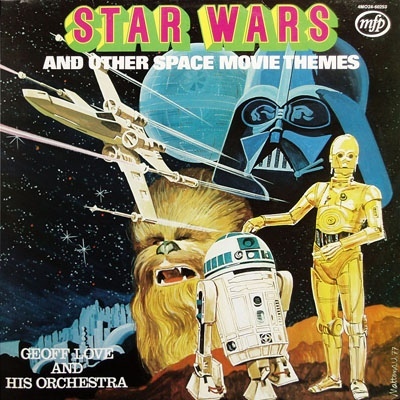 This 1977 album was a spoken word adaptation of the film, narrated by Roscoe Lee Brown and featuring audio clips combined with John Williams' score. In a time when home video didn't exist, this album became widely popular among fans who wanted to relive their theater experience at home. It actually achieved a RIAA gold certification for selling 500,000 copies. With all the exciting action scenes available to use on the official album, I thought the simplicity of the desert scene with the two droids was great. 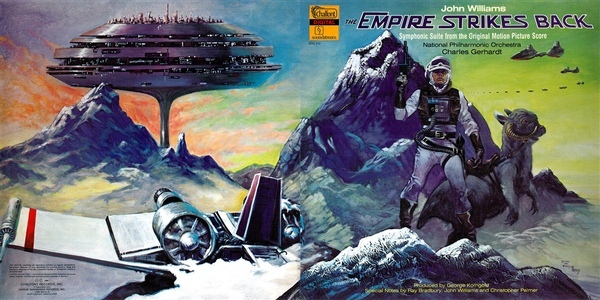 Geoff Love's 1978 album featuring space movie themes was released in several countries and featured a couple different album covers. The one above was released in Belgium and features a great montage of characters, an X-Wing fighter, the Death Star, and more. However, the UK album cover might just make it on my worst list. So technically, I wouldn't call this a Star Wars inspired album, but I couldn't resist adding it to the list. 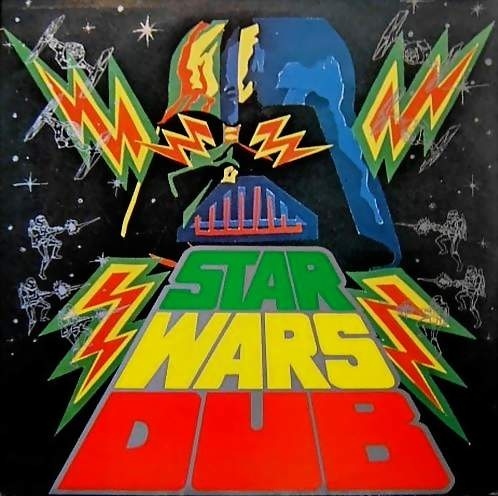 Phill Pratt's 1978 reggae album is Star Wars in name only, but the bright colors mixed with Darth Vader's helmet along with the shaded tie fighters and laser-shooting spacemen make this cover truly out-of-this-world. 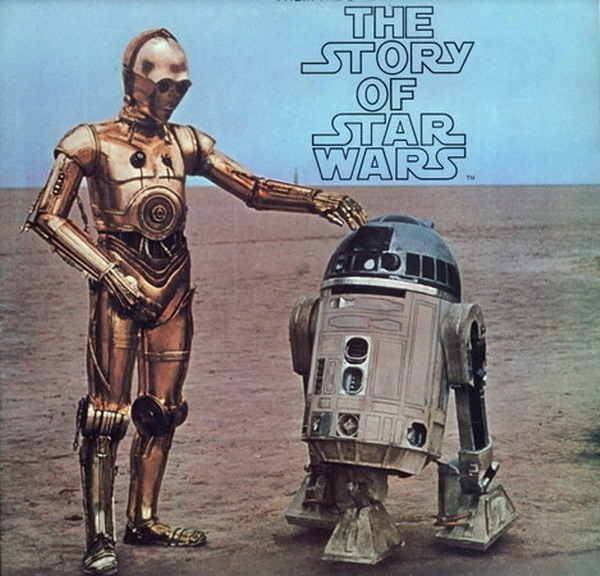 This 1980 album was a spoken word story in the same vein as The Story of Star Wars. Sounds and audio clips from the actual film were inserted with Malachi Throne narrating the story. Jeff Wack illustrates the epic Jedi battle bordered by a brilliant montage of scenes from the film. 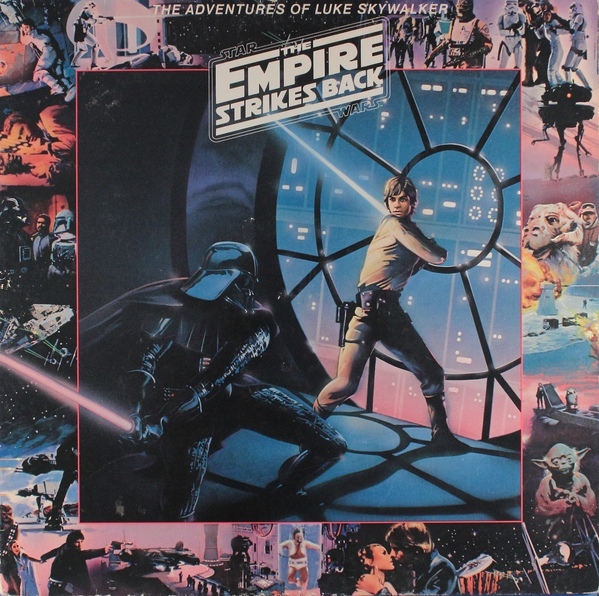 Although not an official soundtrack release, the endorsement of John Williams coupled with a gatefold panoramic cover by William Stout makes this album cover glorious. The illustration gives us the best of the ice planet Hoth while also showing us Bespin's Cloud City in the skies above. 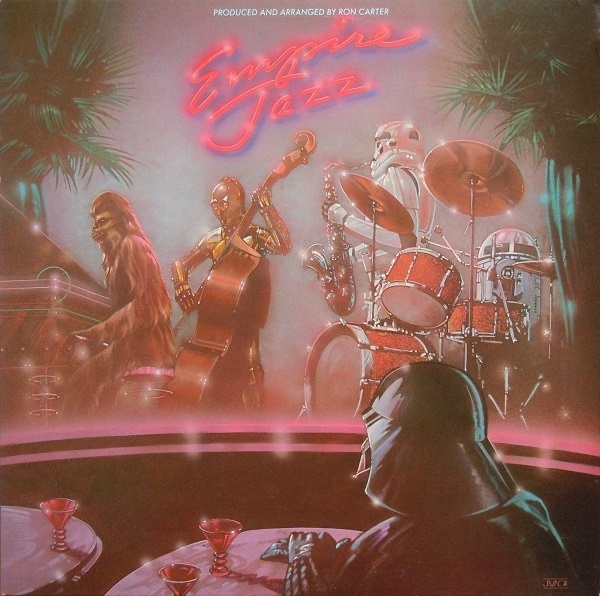 Jeff Wack paints a picture of a smokey bar featuring familiar characters for Ron Carter's 1980 Star Wars inspired Empire Jazz album. Vader looks on as Chewbacca tickles the ivories, a Storm Trooper blows a saxophone, and our two favorite droids handle bass and percussion. A fun cover to match the funky tones of the album. Come back tomorrow as I display some of the worst cover art from Star Wars album covers.